Custom Star Tents - Get Your Customized Star Canopy Today! We developed this stylish and classy custom star canopy tent to ensure that you will always be noticed at any event. The star shape design is ideal for attracting traffic towards your location at any outdoor promotional event. Can be ready to go in under 10 minutes without the need of a large crew. Folds down into small carry bag that fits in any car. 600 Denier polyester top that is long lasting and guarantees protection against wind, water and UV. The crank shaft technology makes the setup of your star canopy easier than ever. Simply slide the pole underneath the canopy and turn the crank to adjust the pole’s height at your own pace. 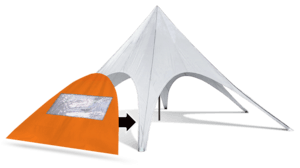 This smart design will properly secure your star tent to the ground and prevent the pole from shuffling on the floor. for your next even with a FREE MOCKUP! We offer a variety of different printing methods available for your ideal customization project. Our focus is to deliver high resolution printed items that will highlight your brand. We use 600 Denier Polyester which delivers a sophisticated finishing that will give a warm and classy look to your tents.